Climate change is adding uncertainty to the long-term effectiveness of current land management strategies. Information is needed to adjust these strategies for projected increased climate variability, longer droughts, more intense rainfall events, warmer summers, reduced water provision and changes in fire regime. Our goal is to discover how climate change information generated by climate and impacts modelers could be packaged most effectively to provide usable information to land managers. We have tried to engage land managers at meetings and workshops, through publications and reports, web surveys and finally through phone interviews. We found that one-on-one interactions over the phone were most effective to learn how consideration of climate change figures into the decision-making process of management activities. BLM managers from eastern Oregon and western Idaho were asked to share their knowledge about sagebrush management and restoration as well as review a series of 8 climate-related web pages from a variety of sources (NOAA, USGS, DRI, CBI). An Oregon State University (OSU) undergraduate student (Melanie Brown), CBI intern, performed ~60 one-on-one interviews and gathered valuable information on climate-dependent management activities and web tool relevance provided with much enthusiasm and interest by BLM managers. Not only did they share their knowledge and opinions on climate web tools with enthusiasm but they also recommended their colleagues contact the student, increasing the sphere of influence of individual phone calls. Brown, M., and D. Bachelet. 2017. BLM Sagebrush Managers Give Feedback on Eight Climate Web Applications. Wea. Climate Soc., 9, 39–52, doi: 10.1175/WCAS-D-16-0034.1.
. Bachelet, D., M. Gough, B. Baker, T. Sheehan, T. Mutch, M. Brown. 2016. Navigating the high seas of Federal Programs to ensure usable science delivery. Abstract#: PA43B-2223. AGU Fall Meeting, San Francisco, CA, 12-16 Dec.
. Bachelet, D. (Invited) 2016. Combining field data and model results to build web tools: Climate console and sagebrush landscape simulator. Spring Valley Field Station Planning Workshop, Hidden Canyon, NV, 21-26 August.
. Bachelet, D., M. Gough, B.B. Baker, T. Sheehan, and M. Brown. 2016. Creating information portals to deliver useful information for management decisions. 11th International Terroir Congress. McMinnville, OR, 10-14 July.
. Bachelet, D., M. Brown, and M. Gough. 2015. Is this what you need? Direct feedback help climate change information exchange. Abstract # PA33B-2186. AGU Fall Meeting, San Francisco, CA, 13-18 Dec. ePoster: https://agu.confex.com/agu/fm15/meetingapp.cgi/Paper/65469.
. Bachelet, D., M. Brown, M. Gough, T. Sheehan, K. Ferschweiler. 2015. So you have data, now what? Sixth Annual Northwest Climate Conference, Coeur D'Alene Nov 3-5.
. Bachelet, D. Developing Usable Climate Tools for Land Managers. 2015. North Central CSC Open Science Conference, "Integrating Research and Management of Change from the Mountains to the Plains", Fort Collins, CO, 20-22 May.
. Brown, M., D. Bachelet and T. Sheehan. 2015. 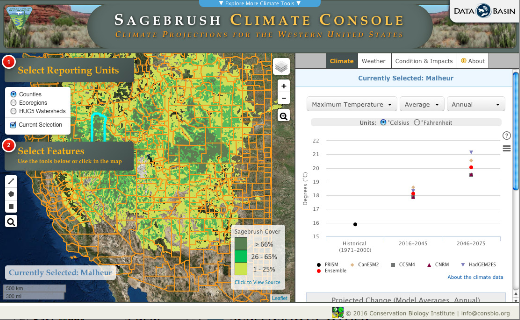 Developing Usable Climate Tools For Sagebrush Land Managers. Great Basin Consortium Conference: "Climate Programs, Water Limitations, and Geospaces in the Great Basin", Boise, ID, 17-19 Feb.
• Collaboration between climate scientists and land managers is key to effective tool development that creates accessible, usable, and useful climate tools for land management. • There is a need for basic information and climate change education to promote the use of existing climate-related web sites and prevent misinterpretations. • Managers need finer spatial scales relevant to their management areas, no larger than a county or ecoregion, and temporal scales that include both near-term weather forecast and longer-term climate projections. • The climate variables most frequently mentioned were precipitation and temperature, but more specifically their seasonality. • Managers need information on climate impacts as opposed to just changes in climate. • The managers' eagerness to share their knowledge with a student: they were willing to share information about what their jobs entailed and explain how climate affects their day to day activities (education component). The young intern was a good listener recording the information and sending back transcriptions for approval of content. • The managers' lack of concern over their limited background in climate science: the young intern was not an expert either so managers could candidly share some of their concerns about the tools and ask more questions than they would in a formal setting with colleagues and supervisors. The student could help them navigate through the tools and sometimes help them avoid misinterpretation. • The managers' real interest in climate change information: discipline-specific jargon is often the main cause of misunderstanding. Personal conversation and dedicated time for interviews allowed managers to 1) discover sites where relevant information was readily available to them, 2) ask specific questions about obscure terminology and improve their understanding of the science behind the projections (education component). Fine spatial scale: in collaboration with colleagues from U. Idaho (J. Abatzoglou and K. Hegewisch (challenging compromise between accuracy and precision. A blueprint for a new type of tool was also designed by the intern after extensive conversations with research team members to focus specifically on impacts to the vegetation cover, as requested by the managers. Using the blueprint, CBI web developer and programmer created a new web application the landscape simulator, (https://landscapesim.org) a state-and-transition modelling framework powered by ST-SIM (from the Apex Group). 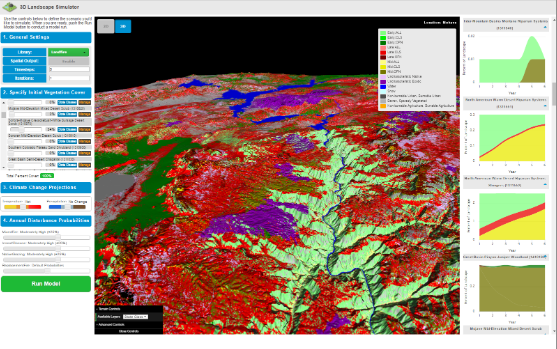 It is designed to simulate the future vegetation composition of a selected area based on a set of initial conditions, disturbance probabilities, and management actions. The project has received some funding from the Great Basin Landscape Conservation Cooperative (Fish and Wildlife) (2015) and is currently (217) receiving support from the Charlotte Martin Foundation (2017) and BLM is providing to continue the tools development and hold training workshops.